TWO Kildare schools recently went head to head in the final of the annual Griffith College Legal Debating Competition. Local rivals Naas and Newbridge saw four students from each area engage in a battle of words resulting in one area coming out on top. Students from the Patrician Secondary School, Newbridge and Naas CBS fought off stiff competition from other secondary schools across the country to have both sides represented by a Kildare school. On the day, students debated the motion “This House believes that the electorate for the Presidency should be extended to voters outside of Ireland”. Debaters had the opportunity to speak for between 3 to 5 minutes, either proposing or opposing the motion. In the end the Patrician Secondary School, Newbridge was named the overall winners of the competition. Griffin Ennis, Glen McLoughlin, Daniel Cocieru and Ben Duffield took home commemorative medals and an ornamental piece of glass to recognise the achievement. 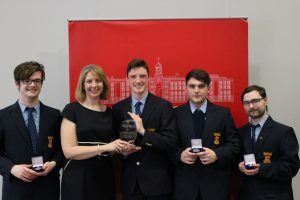 Members of the Naas CBS team, Daniel Connolly, Hugh Barrett, Aman Abadi and Daragh O’Shaughnessy received medals for their participation in the debate.